Known for its beauty, style and elegance, marble has been used in many European palaces during the renaissance era. Although not the hardest decorative stone, marble is still one of the most popular as to this day the metamorphic stone is a widely used building material due to its durability and the ability to bring old-world elegance to residential interiors. When it comes to usage, marble is an all-time premium architectural element and furthermore very versatile as it can grace floors, walls, ceilings, fireplace surroundings or kitchen- and bathroom backsplashes. Homeowners have been seen to even use the stellar stone with its luminous look to decorate outdoor spaces such as pool deck, fountain area or patio. Compared to other flooring tiles such as travertine and slate, marble tiles are less expensive, and the interior designer has the difficult choice between several types such as glazed tile, non-glazed or honed and tumbled. Which type is most fitting and supposed to be selected depends on what look is desired and what part of the house the tile is being used. Glazed tiles have a strong coating but will easily show dents and scratches on the surface as they have a bright shine to them. 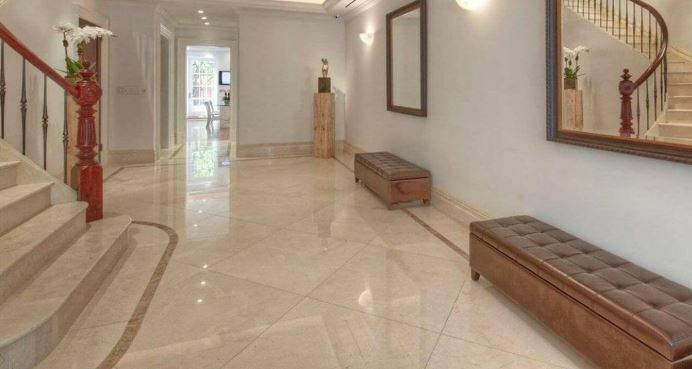 This type of marble tile captivates through its glossy sheen and high stain resistance and does not require high maintenance such as polishing or waxing. Honed or unglazed marble tiles obtain their reputation through their natural looking surface and scratch resistance. This is why these tiles are recommended for use in high traffic areas as they are slower to withstand wear. Nevertheless, honed tiles require a sealer and regular waxing to keep their shine but absorb stains more easily than their glazed counterparts. The finish of natural tumbled marble tile is the perfect choice for people who are looking for an antique or aged look. Tumbled marble gets its rustic characteristic due to its manufacturing. During the process, the tiles are placed in a bin filled with sand and then tossed around until the slabs come out chipped and rounded for an elegant and antique look. The different tile types come in a variety of colours to suit any home décor from patterns such as Chevron-4-Palissandro to Bianca Carrara. They are furthermore widely available in different forms to create numerous designs whereas mostly rectangular shapes are chosen for marble stone rugs, which often decorate bathroom and kitchen backsplashes. For accents, border tiles can be used in hallways for a sophisticated look and finish. For hypoallergenic homeowners, marble is the choice of flooring due to its hard surface and the longevity of the stone is said to last up to five times longer than other tiles. In addition, marble tiles are easy to clean using simple soap water and the low maintenance is another reason why marble flooring makes an ideal choice for busy residents. There is no good or bad marble type, but certainly, some kinds might not be in the budget for the average homeowner. While Calcatta marble comes with a hefty price tag as it is not often found, the common white Carrara is in the affordable range for most homeowners. Firmness, the percentage of imperfections and finish as well as tile installation also add to the final bill. Needless to say, if you consider upscaling your home by using marble products, the results are certainly worth it. Not only has the natural stone proven to combine elegance and aesthetics over centuries, but any homeowner should also know that marble mosaics in flooring or a delicate wall moulding will instantly turn a home into an interior design masterpiece. Next → Next post: How long should a filling last?